Q&A: NFLPA President Eric Winston On Work Stoppages, Colin Kaepernick, And "The NFL Police"
The current collective bargaining agreement between the NFL and its players’ union runs through the 2020 season. But even with training camps in full swing and the focus turning to FOOTBAW, there are still a number of labor-management issues percolating behind the scenes. 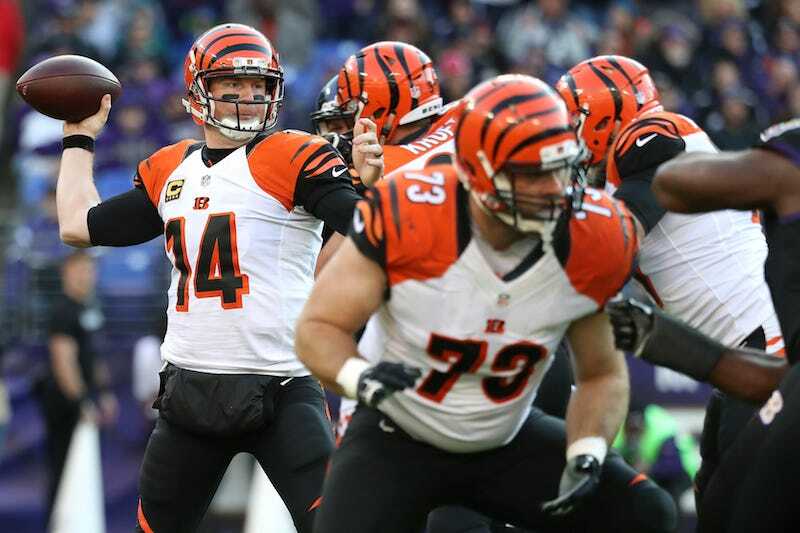 Deadspin recently spoke to Bengals offensive lineman and NFLPA president Eric Winston by phone. What follows is a transcript of that conversation, which has been edited for clarity. Seahawks cornerback Richard Sherman kind of fired a shot across the bow by recently saying players need to be “willing to strike” to get what they want. What did you make of Sherman’s comments? I love the fact that Richard is so involved and cares so much. You’ve got to have a wide range—and this is what I’ve come to know being in the position I’m in—you’ve got to have a wide range of guys that want to be committed. You need the rank and file guys—you need their perspective. But you also need the star players, the star power, and what comes with that, and their perspective as well. I think it’s important that Richard has the demeanor he has and that he’s willing to step out there and take that leadership role. I’m grateful for that because when Richard speaks—not that I don’t have a [megaphone]—but when Richard speaks, people also listen. I think he’s right, to a certain degree. Whether it’s a strike, or we’re in a lockout situation again, or whether we’re just in a renegotiation stance, we have to be ready to sacrifice to make significant gains, whatever we want those gains to be—economic, working conditions, whatever it is. Richard hit the nail on the head, and it doesn’t have to necessarily be—and I’m not necessarily calling for a strike—I think really what he’s saying (and I’m not trying to speak for him) is that players have to be willing to stand up and be accounted for and say, “Hey, this is what I believe, and I’m willing to stand up for it, and I’m willing to sacrifice for it.” I think that’s really at the end of the day what he’s saying, and he’s right. That’s sort of how I’ve always viewed my quote-unquote presidency—and I think it’s a little silly saying it that way, but it is what it is—but I took over three years or so after the last CBA, and I looked at myself sort of as a bridge going forward. And a lot of that is preparing these guys and getting the union—and obviously [NFLPA executive director DeMaurice Smith] does a lot of that, too—but getting these guys in the right mind frame where, when we go into these next renegotiations, that they’ll be on an even better footing than we have been in the past. That’s really kind of what I’ve focused on in different facets. But, at the end of the day, the owners will always have more money. At the end of the day, the owners will always have—I don’t want to say a closer-knit group, but it’s easier to corral 32 than 2,000. And so, I think what [Sherman’s] saying is, “Hey, we’ve all got to be in the same boat together,” we’ve all got to say, “This is what I believe, this is what I stand for, and this is what we’re going to do.” I have no problem with Richard saying that, and I’m glad he did, and I think everyone needs to understand that going in. It’s one thing for a guy like Sherman—a big name who’s on his second contract, and therefore can probably afford to take time off in the event of a work stoppage—but how do you corral the rank and file? Domonique Foxworth wrote something recently about how a lot of the guys who will make up the rank and file once this CBA expires are currently in high school. I know this is a forever problem for the NFLPA. But how do you get everyone to stick together? Have you noticed, as a guy who’s in the locker room and as a guy heading into his 12th season, that there’s a greater awareness of labor-management issues than in the past? I can tell you there’s 100 percent more awareness of the possibilities that are out there now. The fact that [the lockout] happened in ’11—guys didn’t forget about it, and guys know about it now. I’ll give you a perfect example. I came [into the league] in 2006, and we almost had a lockout in 2006; they signed a new [CBA] deal like literally right at the deadline. I never knew that until, like, 2008. Don’t get me wrong. I knew that there was a CBA up. But there was this prospect of an actual lockout happening. And I think that kind of carried over to ’11, like, “Oh, you know what? They’ll eventually get the deal done.” Even though [Smith] was—I remember as a young player—he was running around to every team, literally saying, “Guys, they’re going to lock you out. This is their strategy; I’m telling you, you’re going to get locked out.” I don’t think there was that belief that it could happen. Now, since it’s happened, guys that were still in college when it happened come up and talk to me about it now. They come up to me and ask me about it, like, “Hey, man, what was it like? What happened? Why did they do it? And what do we need to do to be prepared for it?” And all kinds of guys—guys from quarterbacks to running backs to defensive guys, every position group, on my team, and other teams. I tell them exactly what we did, why we did it, and why they did it to us. And the last answer is always, “Yes.” If it happened before, it can definitely happen again. The communication mediums even back then—and you have all these websites now, and of course Deadspin’s one of them, but [Pro Football Talk] and these other websites that literally just cover the NFL, and that’s it, they’ve been looking at those websites now since they were in high school. So they’ve seen it happen, they know what can happen, and I think the awareness around it is so much greater than it was back in 2010, 2011. There are still four seasons left for this CBA. Have there been any talks yet about a renegotiation or an extension, or anything? Cord-cutting is a real thing, and the recent ESPN and Fox layoffs may be a signal that the broadcast-rights model, which the league has long relied on for most of its revenues, is a bubble that’s ready to burst. The current TV deal, which has been extremely lucrative, runs through 2022. But do you get a sense the league fears its primary revenue source will someday be threatened? I think you’re going to have to ask the league that. I think that’s their responsibility to make sure that people are watching this game, that the revenue continues to be generated. They always say, “We’re the business side of this, we’re the ones that produce the revenue,” so they need to go produce it. That’s the way I look it. Obviously, as we’ve talked about with communication mediums, there’s so many different ways to watch a game now, whether it’s online, whether it’s over your phone, through apps, etc., in addition to traditional ones like TV. I’ve seen a lot of different stats. I’ve seen [that] actually more people watched [the NFL] than the year before, but they just didn’t watch it through TV, and I’ve seen that TV ratings are down. We’ll see. At the end of the day, I think it’s the NFL’s responsibility to see that the business is continuing to improve. Has the union studied any of this, though? This obviously affects you guys, too. Yeah, of course. We’ve got to know kind of where it’s going. We’re in the middle of talking to some people that would know, we’re getting our experts kind of lined up [to look at] what maybe the next five, 10, 15 years holds for the NFL in terms of revenue, broadcast production, and things of that nature. We’re definitely talking to people because, like you said, our split, and our revenue, and our salary cap—our guys’ pay—depends on a lot of those big revenue generators. So we’ve got to know where it’s going, we’ve got to know what’s around the corner, and we’re studying that right now. We’re on top of it. You alluded to the owners always having more money to sustain themselves through a work stoppage. What do the players have to protect themselves? We have a lockout fund. The union doesn’t run on the dues of the players. We all sign a group licensing agreement agreement together [NFL Players Inc.]. When someone uses six or more of our players [likenesses], they have to buy a license for it. So think EA Sports, think trading cards, anybody that uses that many of our players likenesses, they have to buy a license for it. We’re able to run a streamlined business, and we’re able to [finance our operations] from that. So the guys’ dues go into an investable account that, if we need to, fund a lockout, or fund a strike, or whatever. But Players Inc. is also a larger-type play that, even if we’re locked out, there might be some avenues in which we can generate other revenue through that, too. If we’re locked out or whatever, I think people still want to see football, still want to see the players, still want to see workouts, etc. We’re looking down the line and starting to explore some of those options of what that might be. Guaranteed contracts come up a lot. I know you’ve been asked about it, and I just wrote a big thing about how complicated the issue really is. Is securing guaranteed deals a big priority for players going forward? I think there’s some players that are kind of coming around to that and kind of understanding what sort of power they have on an open market and what sort of power they hold. I think it’s just a matter of guys sticking to that and sticking to their guns. Obviously, every league structures their contracts differently, and for different reasons. I think that there are things that the union can do to help that along—and I think we’ll try to do that—and I also think there’s things that the individual player and the agents can do, and we’re trying to work in conjunction with them to also help that along. Workplace rules were a victory for the union in this CBA. But a young player once told me those rules tend to benefit veterans, that the younger guys on the fringes feel they might have more to gain from more time on the practice field in the offseason, or more chances to practice in pads with contact. A lot of these fringe guys know they’re expendable. So how does the union balance this dynamic of competing interests among players? It comes back to having a proper representation and making sure that you’re communicating with all the stakeholders that are in the NFL. You can’t just talk to the seven-, eight-, nine-year guys. You got to talk to the rookies, you got to talk to the second- and third-year players, the rank and file guys—all of them, making sure [to find out] how do these rules affect you, and will they be good rules, and is this something that everybody wants? And at the end of the day—and I think you can appreciate this—with a wide swath of guys, whether you’re talking about workplace rules, whether you’re talking about economics or whatever, it’s impossible to cover 100 percent of the issues. So you try to do what’s best for the vast majority of guys. I think what we have now is great for the vast majority. Are there a couple outliers saying, “That guy needs this, or he needs this?” Of course. There’s always going to be outliers on each side of the thing. But we’re trying to make sure our vast majority of guys are benefitting. That’s what we’ve always tried to do. The Ezekiel Elliott situation is still unresolved, and we’re now less than a month from the start of the regular season. Have you heard anything about where that stands? For some competitive reasons, honestly, I can’t really say as much as you might want. If a player’s about to be suspended, I don’t want to know. Unless it gets real public—unless this Ezekiel Elliott got to to be super-public, like a Tom Brady thing [which reached the courts], then obviously I would hop in. But if a guy from [for example] the Ravens is about to be suspended I don’t know if it’s fair for me to really even know. I’m also not a lawyer, so I try to let the lawyers do what lawyers do. What do you make of the NFL’s handling of the whole situation, though? I think this is a case of what I like to call the NFL Police. It’s sort of the morality police. In not letting the actual law enforcement handle it, they think that they have some sort of standing in which they need to go out—it goes back to the whole idea that the NFL is something different than an actual workplace. To me, it’s just kind of silly and it doesn’t really make any sense. We’ve had this ongoing investigation that’s really hurt Ezekiel’s name probably in a lot of ways. But we’ll just see what happens. I know what happened with the [Columbus] police; I know what they’ve done. And at the end of the day, that has to count for something, and unfortunately that’s something that we’ll have to keep talking about down the road with the NFL, but it seems kind of ridiculous that this just keeps dragging on and dragging on and dragging on. That shouldn’t be the case—there should be a finding and a determination, and that’s it. And it’s not just Ezekiel. There’s a lot of guys that are left in limbo because the NFL Police has come after some free agents, and teams don’t want to sign them because teams are worried because, well, are you going to suspend them or not? And the NFL kind of does this eye-roll and shrugs its shoulders, and it really puts a lot of guys in a bad spot. Again, the NFL Police stuff is, in my mind, pretty ridiculous when you start thinking about it. It’s something that’s going to have to be addressed at some point or another. Along those lines, the personal-conduct policy—like the drug policy—can be negotiated separately from the CBA. Goodell’s total disciplinary authority has repeatedly been an issue through the years. To what degree is this something that’s on the union’s radar? We’ve always told the NFL: “Let’s improve this.” Because at the end of the day, that personal-conduct policy is doing nothing but hurting the game. It’s hurting players—specifically, if you don’t have player buy-in, at the end of the day, when you promulgate some rules, you want the buy-in of the players. You look at Major League Baseball, you look at the NBA, you have a system, you have a protocol on how things are dealt with. I think what’s sad is that you don’t have that in the NFL, and this is what you get: You get the NFL Police, you get this circumstance is handled this way, this circumstance is handled this way, oh, this owner holds more sway over this guy, but this owner doesn’t so we can be more aggressive here. It’s that same old thing. It’s the good old boy network that I think a lot of fans don’t like, and I know players don’t like. I think there always needs to be a protocol, there always needs to be a set procedure on how you’re going to deal with things, and when you don’t have it you get what you have the last three, four years—you get mayhem, you get unfair and really unstandardized penalties that hurt certain teams more and certain teams less. I look at it from a competitive standpoint, because I’m in it, but teams can get ready to play somebody, and they don’t even know if they have to go up against a player, and vice versa. You just think about how ridiculous that is. You have this big, massive game, and you don’t even have something as simple as that. I think it kind of speaks to, in a lot of ways, I think it speaks to a lack of leadership [from] the league. At the end of the day, to me, you would want a set system, and it doesn’t seem you have it—you have a lot of suggestions, and then it just depends on what happens. Marijuana has come up quite a bit in the last year or two. Eugene Monroe approached the union last summer, and I understand the union has a committee that’s looking into the issue. And now comes a story about the league wanting to talk to the union about studying marijuana. Where does a lot of that stand? Obviously, the league put that out there thinking that that’s going to kind of force us to negotiate or something like that—I don’t know; I’m thinking that’s why they put that out there; I know we didn’t. We’ve put together a pain management committee because a lot of guys have said, “Hey, listen, I don’t want to take the opioids, I don’t want to be sucking down anti-inflammatories, I think there’s a better way, and this has been a better way for me.” I think you have to respect that. But our responsibility is making sure that alternatives on the whole are as safe as possible as well. We’ve put together a group of doctors, a group of pain-management specialists, to ask, “What are other solutions? Are there some holistic medicines or some other ways of healing that maybe guys don’t know about that we can also help facilitate?” Because I think that’s also important, too. If studies show that doing yoga twice a week, or taking pills, smoking weed, whatever—if that’s a better option, I think guys need to understand that and know that as well. Listen, I understand where some of the guys come from, and we want to do it right. As for how it relates to the league and everything like that: They want to do a study? First of all, I’d want to study what’s already out there. A lot of good, smart people have already done studies on marijuana, the effects, the pros, the cons. I think we need to look at those first and then obviously start talking—not start talking, we’ve been talking extensively to guys about what their feelings are, whether it’s a pro and con of marijuana use, etc., and go down the line and make a comprehensive plan. I think the worst thing we can do is make a snap judgement and say, “This is the answer or that’s not the answer.” Getting the right people together as we’ve done through this pain management committee, and making sure that we’re approaching it the right way is important, and that’s what we’ve done. At the end of the day, it’s going to gave to be a [collectively bargained] topic that’s discussed, but obviously they want something like that on the table to try to leverage. That actually sets up my next question. There was that report that the owners want to make a bargaining chip out of this issue even though they know it’s the right thing to do, which struck me as incredibly cynical. Of course. What’s sad is they would rather use it as a leverage play instead of—let’s just say it wasn’t marijuana. Let’s just say it was some random organic thing—which I guess basically means we’re talking about marijuana—that’s banned. Instead of approving it and saying this is better for guys instead of taking pills, they would rather use it as a leverage point to try to get other concessions. And, listen, I get that that’s some of the game, but players need to understand that, at the end of the day—and I’ve been saying this for a long time—but this whole idea that the NFL is family is kind of ridiculous, when you think about it. Your brother would never leverage a medicine that you need or a better way of healing over you to get something else. That’s where the fallacy comes in. And I tell guys the only family you ever have [here] is the brothers you play with and against on the field, and your union, that’s it. We’re going to continue doing right by the players, we’re going to continue to do the studies and make sure what we say to players and the guidance we give to players is the best and the most accurate representation of what the landscape is, whether it’s marijuana or any other sort of thing on the market. I think that’s what our job is. At the end of the day, we’ll handle the negotiation aspect. From a players’ standpoint, opioids and things like that, seeing what it’s done to some of my friends that have played in the league and the struggles they’ve had with it? I think it’s kind of pathetic that the league looks at it as a bargaining tool instead of what’s best for the players. There have been a couple of painkiller lawsuits out there, along with a grievance from the union over that. Has there been any communication from the league—any reports they share with you regarding opioid distribution or things like that? I don’t want to comment on any of the lawsuits or any of the grievances that are going on right now. Colin Kaepernick’s situation has been a dominant storyline all summer. The union hasn’t had anything to say about it, and he really hasn’t, either. Has he approached the union at all? What kind of communication has there been, and what’s the union’s stance on this? We’ve been in contact with Colin’s representatives, and we’ve let them know that we’re there and ready to help with whatever they’d like—whether it’s just some guidance on PR or whatever. I know they’ve chosen to lay low, and I respect that—every player has to make a decision on how they want the union’s help, and I completely understand that, and that’s fine. The union’s always stood ready to help him in any way that we need to. We will continue to monitor that situation, we’ll continue to do anything that we can to make sure that he has another opportunity to play. At the end of the day, that’s really it. We’re not going to force ourselves on a player. He’s calling the shots, he wants what he wants, and I respect that, and that’s what we’ll do. Do you get the feeling there’s any kind of blackball or soft blackball going on? Of course. You definitely get that feeling—obviously, that’s very hard to prove and it’s very hard to show. But, at the same time, for Christ’s sakes, you have an owner out there publicly saying, “I’m polling fans to decide whether I should have this guy on my team or not.” It’s obvious that owners are scared of it, are worried about it. That’s fine. I guess that’s their business or whatever. But it kind of seems a little ridiculous to me. To act like Colin isn’t one of the top—let’s just call it 64 quarterbacks in the world right now is even more disingenuous. The fact that he’s not on a team right now, I think, kind of speaks to that. It’s kind of pretty silly.